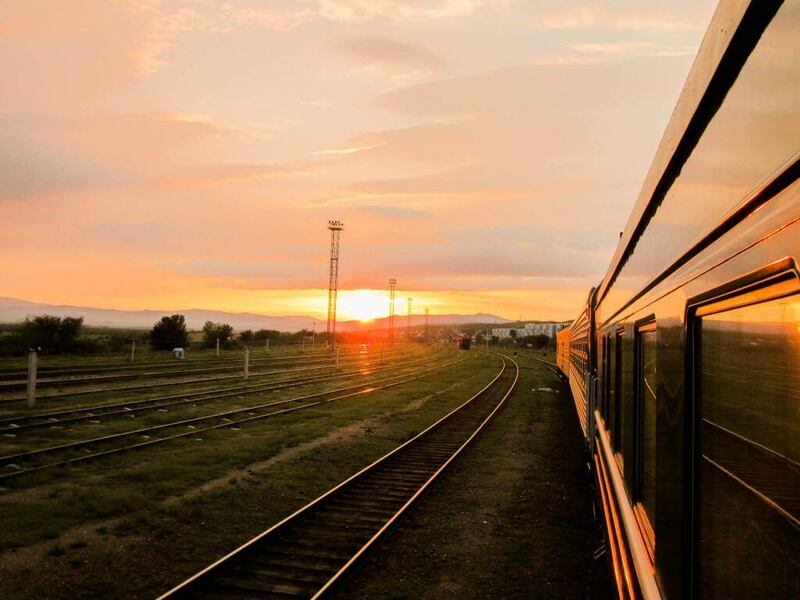 Traveling with the Trans Siberian Express was a lifelong dream for me. I would be overwhelmed by the political power that the Kremlin radiates, toast with surly Russians to new-found friendships, feel the golden glistening sand of the Gobi desert flowing through my fingers and feel the greatness of powerful empires of the past whilst standing on top of the Chinese wall. My dream was big. But achievable. And so is yours. And so, there I stood on a warm summer’s day, ready for the journey of my dreams. Backpack strapped to my back, strategically packed to survive the train ride for days in a row. Jumping up and down with enthusiasm – because never a lack thereof. Ready to travel the longest railway in the world. The only sound being a soft thumping of the train on the 9288 kilometers of rails. And so it happened. And these are the 7 reasons why you should AB-SO-LUTELY travel with the Trans Siberian Express as well. The TransSiberian Express is not like the Hogwarts Express. There is not one magical train that carries the illustrious name and will take you to your magical final destination. No, the name Trans Siberian Express comes from the name of the railway: the Trans Siberian railway (in Russian: Транссибирская магистраль), which was devised in 1891 by Tsar Alexander III and which runs from Moscow to Vladivostok. If you travel with the Trans Siberian Express, it actually means that you are traveling on the Trans Siberian railway. Keep that in mind, because sometimes I will keep referring to it as the Trans Siberian Express. Simply because ‘the combination of separate trains that you will take that thunder over the Trans Siberian railway and sometimes deviate afterwards’ just isn’t as catchy. The Trans Mongolian Express and other routes also fall under the name Trans Siberian Express for the sake of this article. You know the ones: the destinations that everyone seems to visit. Young twentysomethings travel around the Thailand-Laos-Vietnam-Cambodia circuit. And every self-aware yoga babe goes to Bali to find herself. And that’s fine. More than just fine. The rule with traveling – and with everything in life – is: do whatever you want (up to a certain degree of course). And if you want to meditate in the midst of rice fields, no one will shout louder ‘GO FOR IT!’ than me. But the Trans Siberian Express … is a journey of a different caliber. Perhaps it is the fact that you are on the rails for about a week non-stop – not counting the days you leave the compartiment to explore the towns, villages and nature alongside the track. Or perhaps it is the idea that you have to arrange a lot, that scares people. The fact is: it’s a journey that not just anyone takes and that makes it unique. Where in Thailand buses and buses filled tourists leave Bangkok to head to the islands, here you are less likely to wonder where the locals have gone. Admittedly, as we approached our wagon I was shocked by the Dutch chatter that rang from the half-open windows – man oh man, we children of clogs really can be found anywhere in the world. But from that moment on, it really feels like you’re embarking on an adventure with relatively few travelers on alongside you. Alright, so we have established that traveling with the Trans Siberian Express actually means traveling on the Trans Siberian railway. And that doesn’t have to mean traveling until the end of the railway. Multiple (international) long-distance trains (partly) use the route. And that means a party for you, because there are several routes to choose from! How about the two trains that go all the way through Russia and that take you to final destination Vladivostok, but each via a different route? The Trans Siberian Express and the BAM Express will take you there. Or add another country to the list and travel via Russia to Beijng in China with the Trans Manchurian Express. 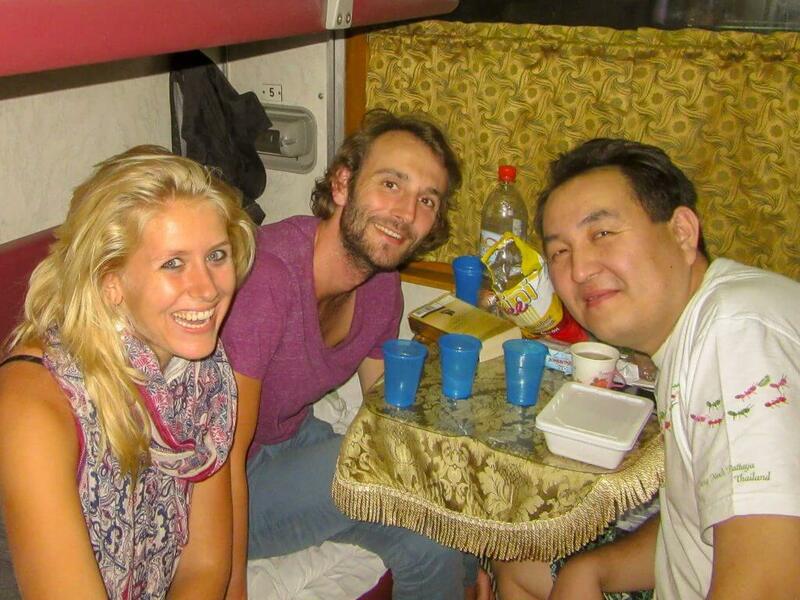 And what about traveling through Russia, Mongolia (see the photo journal) and China with the Trans Mongolian Express. I took the latter and would have never ever wanted to miss it in my life. Here I tell you how to choose the route that suits you best. Для твоего здоровья (pronunciation: ‘Dlja twojego zdorowja’) – or a seriously bastardized version of it – sounds through our compartiment. Plastic glasses collide in the air and the cold liquid flows smoothly into our throats. The hefty Russian sitting in front of us looks at us blissfully and begins a – only half-understandable – story about his life. Contact with the local population is often high on the list of us travelers, but is often complicated by language barriers, staying in hostels with only fellow travelers or lack of meeting points. A trip with the Trans Siberian Express makes all of those obstacles disappear like snow before the Russian sun. The real challenge is not to engage in cultural exchange, when you spend days packed together in a space of 2 by 2 meters. Bony knees that gently brush each other and nothing (depending on your preparation, about which you’ll soon read more) than the view and each other to entertain you. A young man in his mid-twenties cheerfully enters our compartment. White-blue sleeveless shirt that matches his white-blue shorts. He puts his mouth to the 2-liter soda bottle, takes a sip, hands it to us and asks: ‘you?’. Can you see that happening in the U.S. or the Netherlands? One of the benefits of traveling with the Trans Siberian Express is that you can experience true Russian hospitality – and never have to go hungry or thirsty. Because if there are any people that understand the over-used saying ‘sharing is caring’, then it are the Russians. All that is digestible – both solid and liquid – they will put on the minuscule table under the window and is meant for everyone. Even locals from other compartments offer us cheese and bacon – from home-bred pigs. Well, why not! And yes, we drank a lot of пиво (pronunciation: ‘pivo’, meaning beer) and водка (meaning vodka), we ate a kind of Russian deep-fried bun with pieces of apple in it (comparable to the Dutch ‘oliebol’) and we tasted dried fish and many other indefinable goods. While books are great for getting background information, they tell us less about how the population really thinks about the country and the issues that take place there. The only way to find out for yourself, is to speak to the population. And that is possible during your trip with the Trans Siberian Express. The language barrier remains a major obstacle, because English is not the strong suit of many Russians (and/or Mongols and Chinese). But listen carefully and you learn more about the country and the population than you ever imagined. And because everyone uses the trains that run here, you’ll meet people from all walks of life. 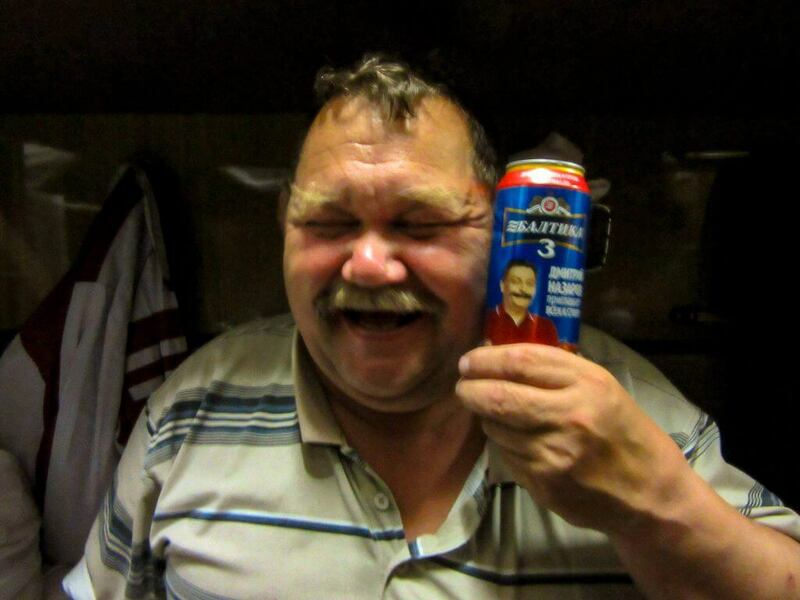 Our Russian friend Vladimir, for example, turned out to be particularly concerned about the strict anti-smoking policy of his namesake. Something we knew through compartiment-mate and lawyer Anastasia, who acted as an interpreter between us. Railway workers Maximilian and Alexander told us about their work alongside the track and the enormously long days they had to work. And they certainly had something to say about the climate. Nicola was the nationalist blabbermouth who was stationed in the GDR (German Democratic Republic) between 1976 and 1978. You know, East Germany that was occupied by the Soviet Union after World War II. A cheerful, half-drunk, pro-Putin-Russian stumbling over his words, who told us everything about the Cold War in poor German. And about how great Putin is of course. 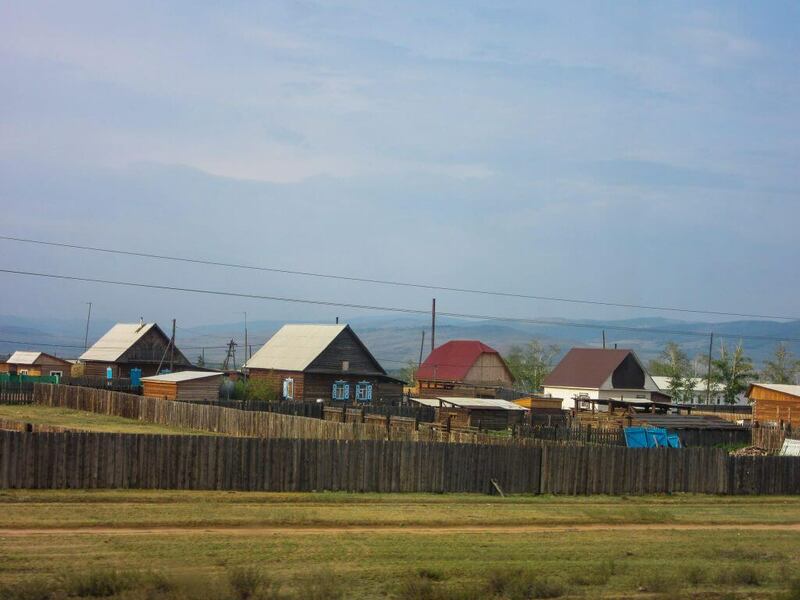 Mongolian anthropologist Bair could not let a minute go by without dropping the word Buriat – the largest indigenous tribe in Siberia, to which he belongs, and who lives around Lake Baikal. One of the biggest dilemmas for the environmentally conscious frequent traveler is how you can travel as much as possible and still keep your ecological footprint as small as possible. Well, train travel is a fantastic way to do this. 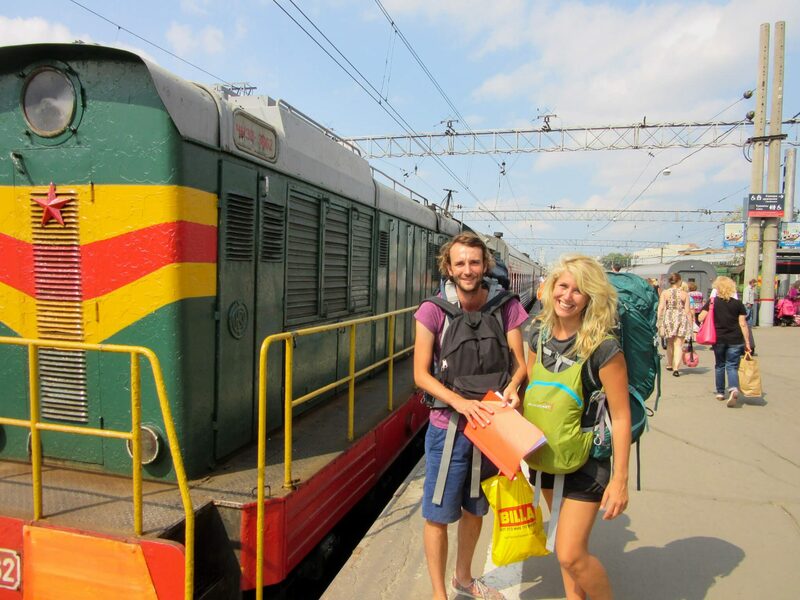 If you choose the Trans Siberian Express as your means of transportation – and of course, after reading this article you will do just that – then it is a lot better for the environment than flying. At Eco Passenger you can calculate exactly what the impact of your trip is on the environment. If you take the classic Trans Siberian Express route (9288 km), you have a CO2 emission of 316.1 kg. If on that same route you would take a plane, your emissions are 1305.1 kg. By train you therefore emit 76% less (!) CO2. And so you can enjoy your journey with a clear green confidence. Like a small child leaving her house for the first time, I sit on the leather seating with both hands stuck to the dusty window. Eyes flying from right to left and back again. Taking everything in. When traveling by plane, you are ‘Clickety Click—Barba Trick’ (or for the Dutchies ‘Huub, Huub, Barbatruc) in a completely different world. But travel by the Trans Siberian Express and you can see everything changing. Step-by-step. Near urban hot Moscow I gazed at the sometimes desolate neighborhoods that the train rattled through. Reaching the wooded area it were the pine trees I stared at – a view that did not change for two whole days. And so the train went on to glittering Lake Baikal in brisk Siberia with beautiful views of the lake, through the dried up desert plains of Mongolia and ending in an Asian metropolis. And you can see it all. Time travel. It sounds like a futuristic dream. And it is. If you take it to mean tumbling through a wormhole only to end up in the Middle Ages to wander as a damsel or esquire in overgrown castles. But time travel in a different sense of the word is in fact possible. And that kind of travel, you will experience with the Trans Siberian Express. Moscow lies in time zone UTC+3. End-of-the-line Vladivostok in time zone UTC+10. That is seven hours of time difference through which you’ll travel. And that means no jetlags. As soon as the train leaves Yaroslavsky station in Moscow your sense of time fades. Seconds become minutes, minutes, hours and hours days. And that is a breath of fresh air. I feel the burning sun shining on my head and am happy that blonde sun-reflecting locks of hair fall alongside my face, instead of dark-sun-absorbing ones. I close my eyes against the bright light. It is clear: it’s high summer when I am looking for the right platform at the train station in Moscow. 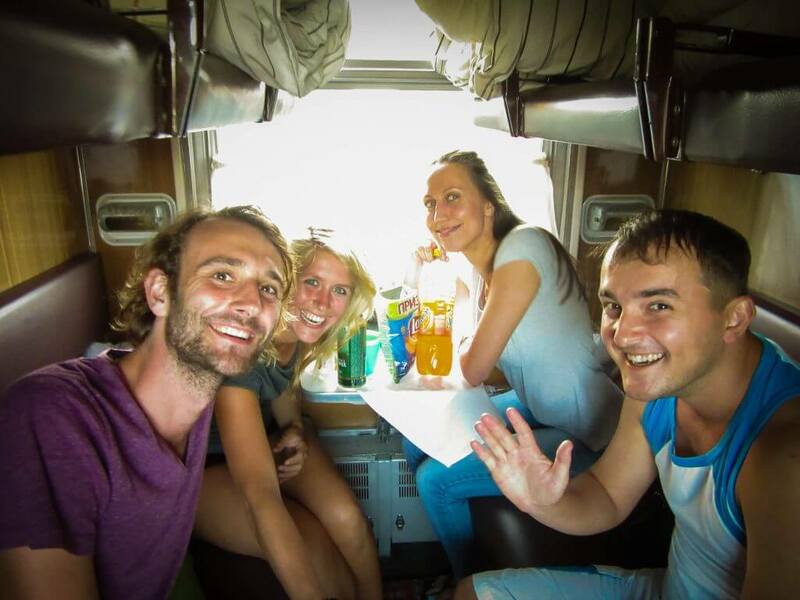 And a summer trip with the Trans Siberian Express is completely different than a winter one. Where I eat ice cream on the Red Square, two seasons later it just as well may be ice on which I’ll stand. Where I swam in Lake Baikal, I’d be able to drive over it in winter. With car and everything – which seems totally unimaginable with an area of 31,722 km² (that is about the same size as Belgium). 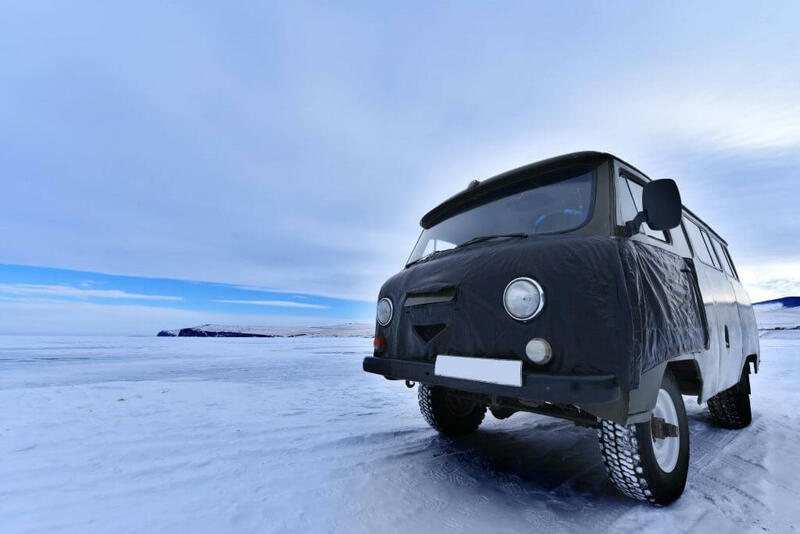 At Lake Baikal it is possible. And that changes your experience drastically. So while this article started with giving you the 7 reasons why you should take the Trans Siberian Express once in your life, the better question now is: why not twice ?! And if that seems like an overkill, what about taking any of the other routes? Fun And if you think that is just a bit too much for the good, do you take one of the other routes? 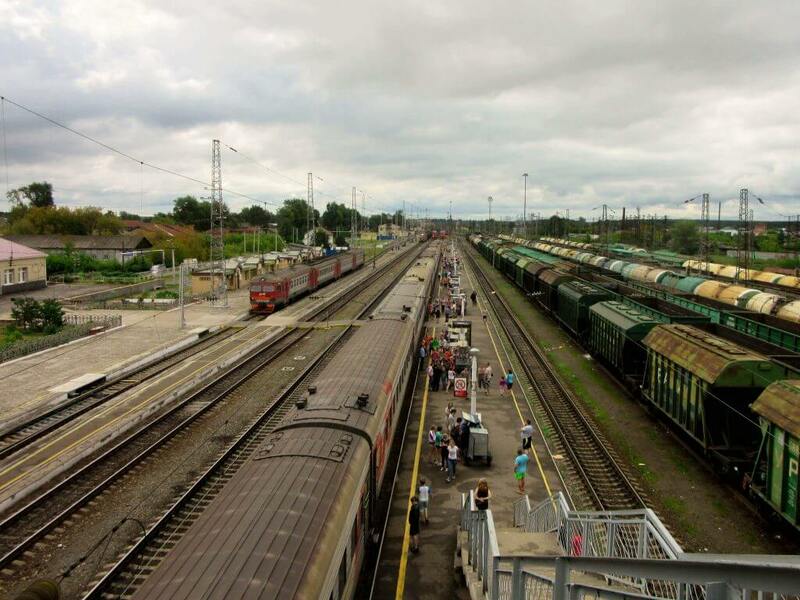 Has you ever though of traveling with the Trans Siberian Express?